Parkland, WA based Lakewood Auto Body is a locally owned and operated car painting/truck painting and auto body repair shop. Since our establishment in the year 1962, we have been meeting the car painting needs of the residents of the area efficiently and professionally. 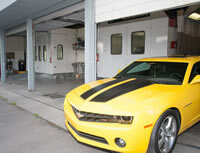 Our services include auto body painting, custom auto painting, auto body and mechanical repairs. Mo matter your vehicle needs a simple car scratch repair or a serious collision repair, Lakewood Auto Body covers all. We use high quality tools and equipments, industrial finishes and custom paints, and state of the art technology to provide our customers with unmatched services. Do you know that bodywork and paint are considered more as an art than any mechanical procedure? A simple car scratch can affect the appearance of your Audi, so it is advisable to get the scratch repair done timely. Car or truck painting is more than just picking up a few cans and spraying the paint on your car. An excellent paint job is result of hours spent on sanding, welding, and preparing the car body for spraying and painting. Lakewood Auto Body is the auto shop in Parkland, WA that provides quality painting services that restore the original look of your vehicle. Lakewood Auto Body,based in Parkland is a leading and most successful car painting/truck painting shop meeting the car painting needs of Audi owners of the region. We believe that commitment and honesty of our expert mechanics has earned us the tag of number one auto body paint shop in the industry. It is our personal pledge to paint your vehicle thoroughly and surprise you with our exceptional services. Call Lakewood Auto Body at 253-581-0220.